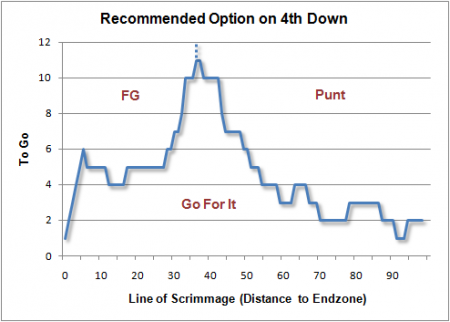 The graph below gives the recommended option for 4th down situations for NFL teams. This chart gives the recommended options for 4th down based on yards from endzone and yards to go for a first down. On the line or below it teams should go for it. It was created by Bill Burke at AdvancedNFLstats.com These options were determined using actual NFL game data from 2000 to 2008 ... along with a lot of math. This graph and 4th down advice was put together in an article called "The 4th Down Study" by Brian Burke, a football fan and closet math enthusiast. We have two activity ideas. Younger students ... 4th through 7th grade can try our graph reading activity. Older students ... 7th grade, 8th grade, and high school can learn how this graph was created. Even if you teach older students, you might chose to do the elementary version. Here is a link to little video of a team recently going for it on 4th down (youtube link) And check out the 4th down bot from the NY Times. It weighs in on each 4th down decision from recent games. Plus here are some other NFL math activities! Watson Saves - Watch the video with your class and use our activity to motivate students to figure out who ran a greater distance by using the Pythagorean Theorem. In the video Teddy Bruschi says that Watson must have ran about 120 yards, maybe even more. Use the video and/or our activity to see if Teddy’s estimate is about right. NFL Home field advantage Students use an infographic to compare NFL team home and away wins. Students consider the best home team, the best away team and consider if NFL teams really do seem to have a home field advantage. Losing Teams in the Playoffs A look at the worst teams (by regular season record) to ever make the playoffs in the NFL, NBA and MLB. Fractions, Ratios, Percent. Updated! NFL Franchise Values A look at the actual value of each NFL team. Reading graphs and then looking at the concept of mean through fair sharing or redistributing. Concepts and authentic data... delicious.